Coconut seems to be one of the buzzwords of the year, finding benefits in its addition to skincare, healthy eating and even haircare products. You name it, there will be a coconut-related alternative or variation to try. 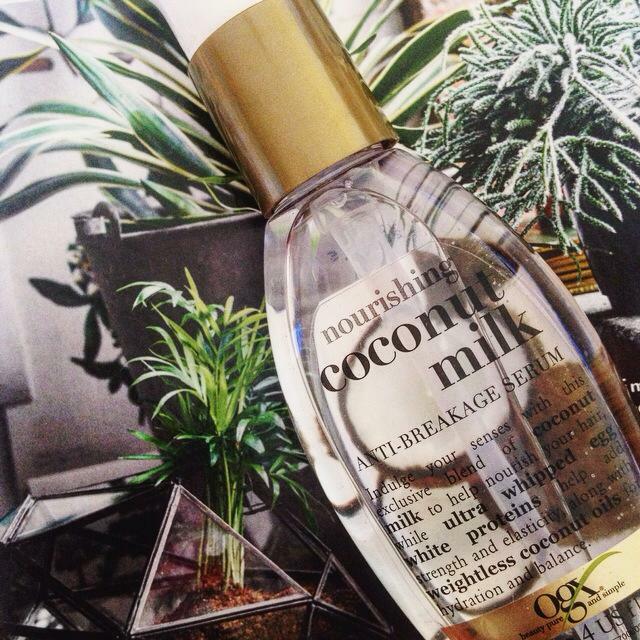 Hair serums are no exception, and OGX's Coconut Milk Anti-Breakage Serum uses the properties of coconuts to promise longer locks and less damaged ends as a result of its use, as part of their Coconut range. The Coconut Milk combines a blend of coconut oil, whipped egg white proteins and coconut milk itself, a weightless formula that you apply after washing to towel-dried hair from your palms. It comes in a cute little bottle with a pump dispenser, and you get quite a lot for your money - 118ml for £5.99 goes a long way when you're only using a drop or two per application. As you'd expect, the scent is coconut-y, which isn't my favourite for hair products - I much prefer sweet, fruity scents. However, it isn't at all lingering and it pretty much disappears when it's dry. When I first started using this serum, I put it through most of my hair but just avoiding my roots which made it a lot more wavy than it usually is - something I find serums tend to do to my hair. If I'm looking for volume and more defined waves then the serum is great, but when I want a sleeker look I tend to just rub it into the ends of my hair. As a result, they are much more hydrated and silkier, which is great for drying split ends and heat-damaged hair. When the ends are not looking as drab, my whole hair tends to look healthier (especially if you are in desperate need for a haircut but don't have time to get one). I like to use it with the Philip Kingsley Daily Damage Defence which adds shine all over. Just be careful not to overuse the Coconut Serum as too much may leave your hair on the greasy side of shiny. So if your hair is lacking moisture, this will put some life back into it and bring you back to that healthy, just-cut-and-washed-at-hairdressers look that is near on impossible to maintain in the temperamental British weather. You can buy it from high-street stores such as Superdrug and Boots, or online at Feel Unique.